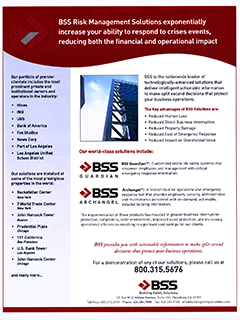 Graphic Design & Fine Art for Business from Building Safety Solutions, Inc.
Brochures, One-Sheets, Marketing Packets, etc. Updated logos, edited text, cleaned-up graphics in older marketing literature. Created new marketing collateral, as about new mobile device and new family of products. Put together folders of marketing material, for commercial real estate and corporate sectors. Trained office assistants in the copying, binding, and assembly of marketing collateral, and keeping it in stock for Sales executives.